QuantaStor storage servers require a license before the software can be utilized. Each individual server requires its own unique license so a 3x system cluster will require 3x license keys. QuantaStor is available with 5 different license types: Enterprise Edition, Trial Edition, Cloud Edition, Data Migration Edition, and Community Edition. 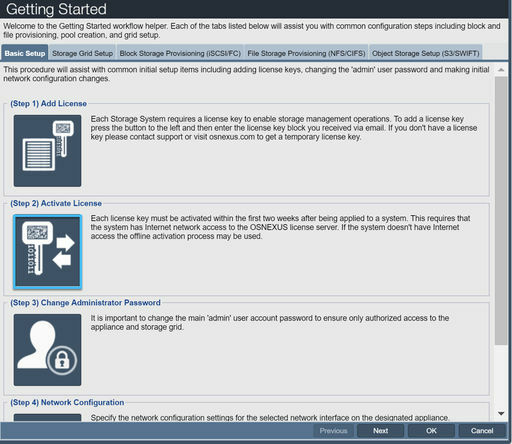 When systems are combined to create a storage grid all the licenses should be of the same type. Commercial licenses used for the majority of deployments, all features are enabled. Time limited (30-day) and capacity limited (256TB) Enterprise Edition license, all features are enabled. Expanded Trial Edition licenses are available from OSNEXUS sales for PoC activities. Limited capacity (40TB) license which provides most features and allows formation of 3x node storage grids. Non-commercial use only. Same as Enterprise Edition but it enables a specialized PayGo license management system for Cloud Service Providers. Same as Enterprise Edition but enables customizations and management features for mobile data migration servers including LED front panel management. 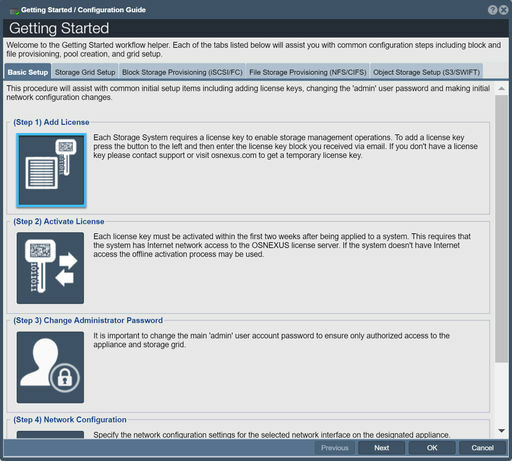 Once QuantaStor has been installed on a given server, the first step add the storage system License if it hasn't already been added by the solution provider. If you were provided new or expanded licenses via email they'll come as a block of text referred to as a License Key Block. Input the License Key Block via the Add License button in the Getting Started dialog or via the License Manager which is accessed by pressing the License Manager button in the toolbar.